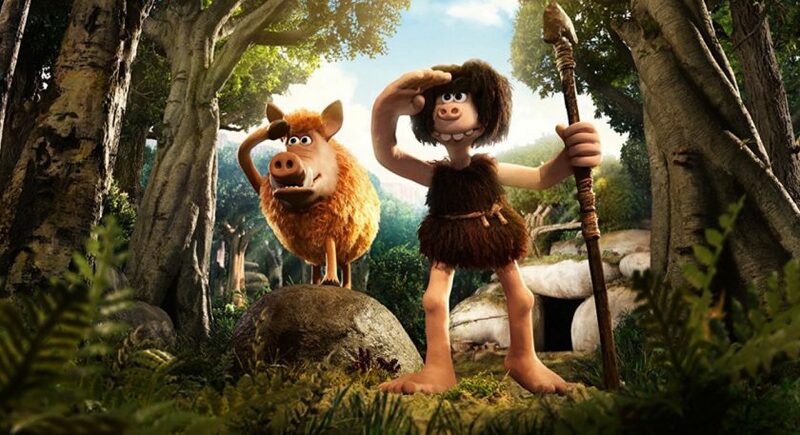 This latest offering from Aardman of “Wallace and Gromit” fame is a total delight for both adults and children. The story takes place in the cleverly fictionalised cross over period between the Stone Age and the Bronze Age – and they must have crossed over of course. Humanity did not wake up one day and say “Right, Stone Age ends here. Beginning of Bronze Age.” The tone is set by a prologue when a meteor hits the earth “around lunchtime, somewhere near Manchester” and the ancestors of our Stone Age heroes are not only nearly wiped out but invent the game of football. The main part of the story concerns a simple Stone Age community many centuries later, where Dug (Eddie Redmayne), who’s a bit brighter than the rest of the tribe, has ambition. He wants to hunt mammoth rather than their staple prey of rabbit. The oft pursued rabbit itself by the way is a particular joy, who could give that old Br’er Rabbit a run for his money. But the tribe leader Bobnar (Timothy Spall) is all for tradition. When the community is invaded by the Bronze Agers however, the tribe is driven out of their cosy valley to the sterile Badlands and threatened with enslavement and it is up to Dug to rediscover the tribe’s lost heritage of football and challenge the Bronzers to a match which will win back the tribe’s freedom. Director Nick Park and his skilled animation team have created some delightfully comic characters, all beautifully voiced. Apart from Dug and Bobnar, there’s the leader of the Bronzers, self-important Lord Nooth (Tom Hiddleston), who speaks somewhat inexplicably in a cod French accent. I don’t know of any evidence that the Bronzers came from across the channel but what the heck. The heroine is early feminist Goona (Maisie Williams), who rebels against the fact that footy is a Bronze boys only sport and coaches the Stoners is the beautiful game. Smaller role treats are Rob Brydon, voicing both the pigeon post messenger, who takes his transmission duties too literally and two football commentators, both called Brian, who cover the climactic football match. And I should mention Dug’s piggy sidekick Hognob. No dialogue but an expressive persona and a lot of oinks, provided by director Nick Park himself. The setting of the Bronze Age settlement is particularly impressive in its use of – well – bronze. It does for that metal what King Midas did for gold. The dialogue is witty, with lots of clever puns and like any good contemporary comedy about a bygone age, it is full of sharp and satirical observations on our world today. And Aardman’s claymation artists have technically and creatively excelled themselves with this one. A film for lovers of top class animated movies – and football.